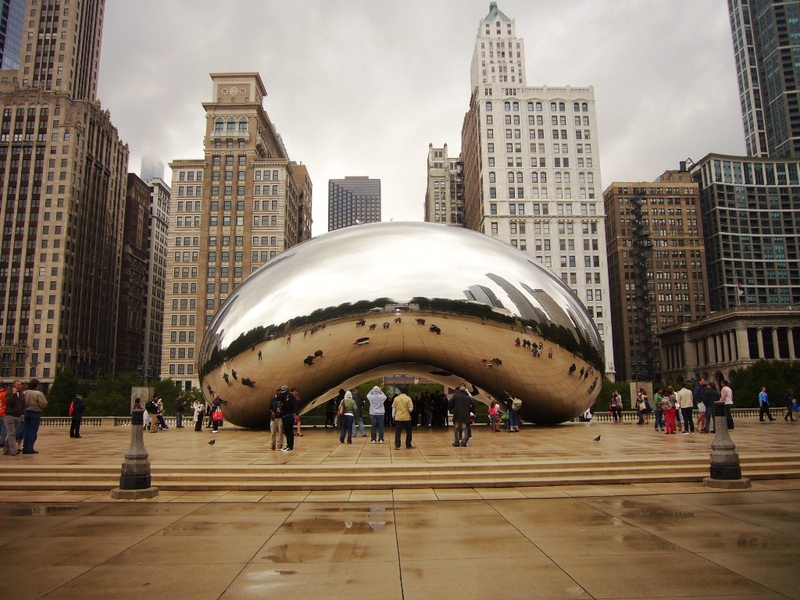 Chicago’s iconic bean – no wonder it’s a foodie mecca! Also known as a “Chicago Dog”, the Vienna beef hotdog seems to be most Chicagoans’ fast food of choice. Crucially, the sausage needs to be made of beef, the bread needs to be a steamed white bun, and the whole thing needs to be topped with seven condiments: mustard (never ketchup! ), relish, tomato, onions, jalapeno peppers, and one of those giant pickled gherkin things you see on top (you can use it to squish everything else down). 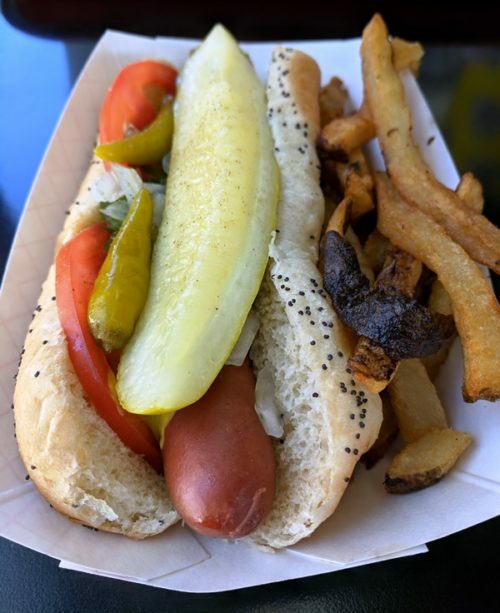 I tried this at the over 50-year old George’s Hot Dogs in Bucktown, thanks to a food tour I took with Chicago Food Planet. I then tried another at Al’s Beef (more on that below) – both were pretty damn good. 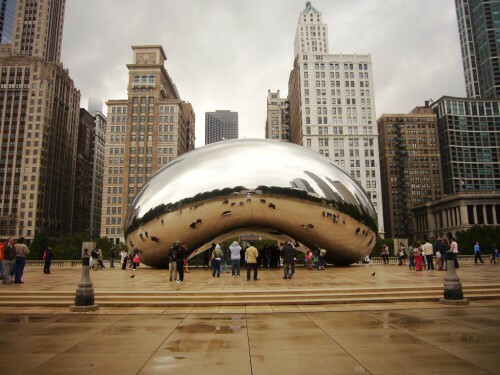 Don’t leave Chicago without trying one of the city’s hotdogs! 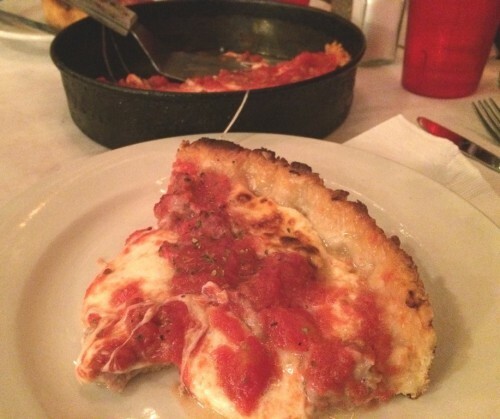 If you want to eat like a local, thin-crust pizza is where it’s at. If you’ve spent any time in Italy, though, prepare to be appalled. Thin-crust pizzas in Chicago are nothing like those of their European cousins. Where in Rome you’ll want to order a straight margarita (why make a simple thing of beauty unnecessarily complicated? 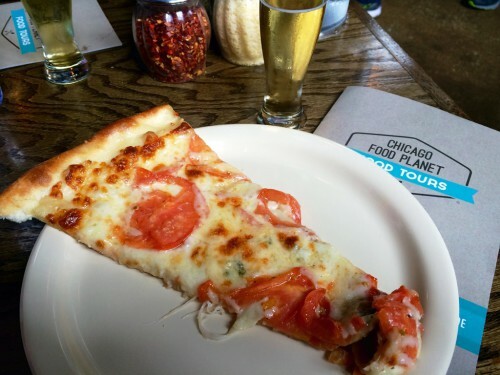 ), at Chicago’s Piece you can expect toppings like BBQ sauce, jalapeno peppers and even mashed potato. I know – mental. This is proper hangover food. Trust me. It’s essentially a sandwich that involves thin slices of beef, dripping in their own jus, stacked into a soft bun (to soak up the juices) topped with a whole heap of hot, spicy, pickly goodness. Once again, it bears no resemblance to anything you’ll ever eat in Italy. But don’t let that get in the way of a good sandwich. 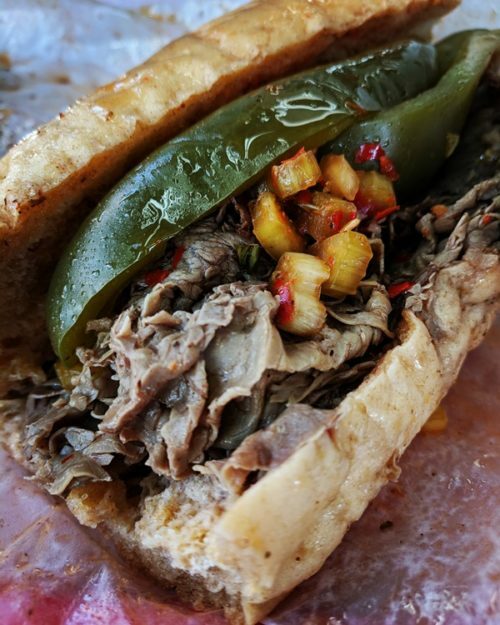 Al’s Beef might not be much to look at, but it’s been voted the #1 place in Chicago for Italian beef, and purveyor of one the top five sandwiches in America. So there. Any visit to the US is always a great excuse to eat decent Mexican food, and Chicago is no exception. 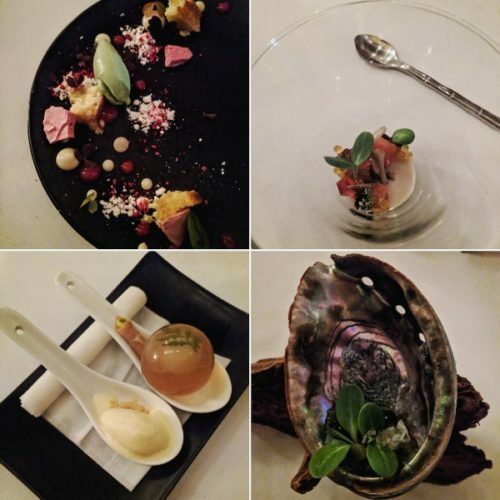 I was lucky enough to be taken to Topolobampo – one of Rick Bayless’s empire of restaurants. This one serves upscale contemporary Yucatán food. 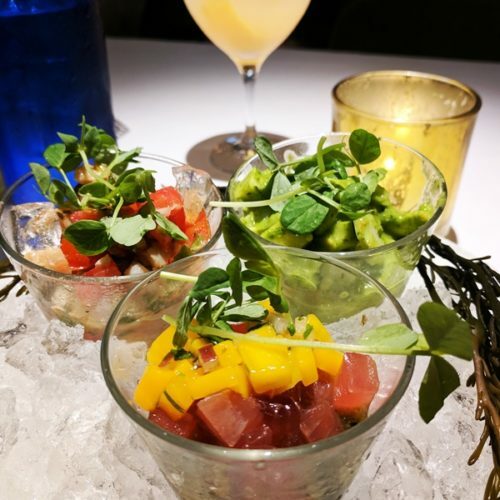 The trio of ceviche was standout (be sure to get a margarita to go with them), as were the main courses we tried: tinga poblana tostadas, and wood-grilled quesadillas stuffed with beef short rib and a charred tomato salsa. 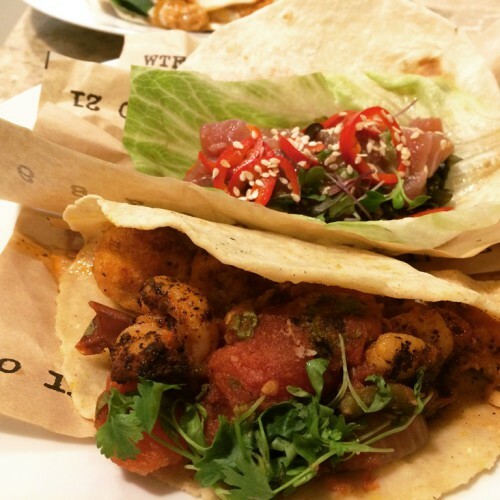 If you can’t decide what you want for dinner and aren’t a purist when it comes to tacos, I’d strongly recommend checking out Velvet Taco. They fill their corn tortillas with everything from buffalo chicken and blue cheese dressing to falafel with tahini. Their tuna taco doesn’t even come in a corn shell – it comes wrapped in lettuce. Like I said: not one for the purists, but highly delicious nonetheless! I also get quite excited about sushi when I go to the States. Not because you can’t get decent sushi in Amsterdam, but because it tends to be a rather formal and pious in comparison to its flamboyant American sister. 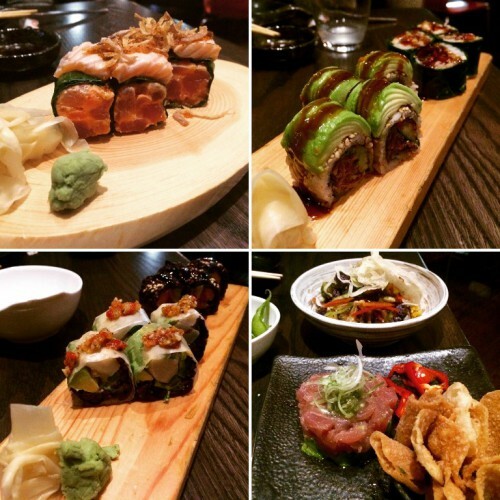 Both have their place, but U.S.-style sushi is just – well – fun. I spent an ungodly amount of money on the stuff at Union – but it was worth it. I can’t really begin to describe what was in all those rolls (apart from the fact that some of them were filled with black rice instead of white – whaaaat?! ), but just take a look at the photo collage – it’s got Mouth Party written all over it. For some inexplicable reason, Mr Foodie claims not to like gnocchi which means I hardly ever get to eat it. So when the cousins took us to a Chicago-Italian restaurant – Franco’s – I jumped at the chance to order their famed homemade gnocchi. It was simple, cheap and cheerful, but well worth every cent. Order a glass of house red wine to wash it down, and sit at the bar for great people watching. And now for something completely different. 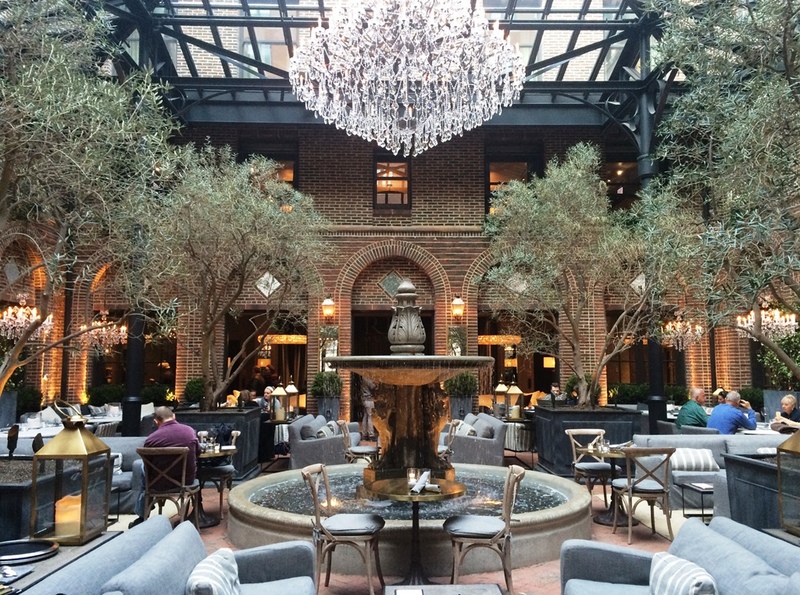 Restoration Hardware sounds like a furniture store, and indeed is a furniture store. But it is also home to one of the most elegant dining and drinking establishments I think I’ve ever visited. 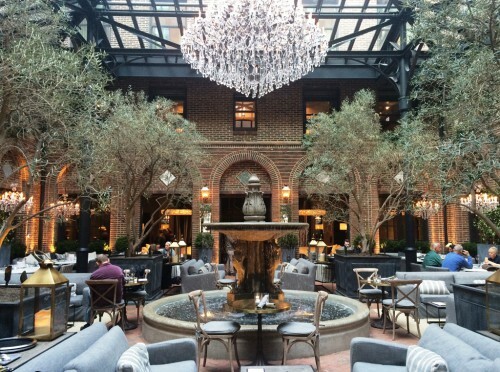 Bedecked with chandeliers and fountains, it might not seem like the obvious place to take a seven-year old. But they serve the most amazing chocolate and sea salt cookies (for the kids) and pastel-hued, grown-up bellinis (for the adults). As regular readers will know, I don’t have much of a sweet tooth. I made an exception, however, for the hot chocolate and home-made marshmallows at the eponymous Mindy’s Hot Chocolate in Bucktown. Chef Mindy Segal has won a bunch of awards as a pastry chef, and it’s clear why: she makes quite simply the thickest, richest, tastiest hot chocolate that’s ever passed my lips. And the marshmallows are like dreamy puffs of raw meringue – heavenly. Tiki bars seem to be enjoying a revival in the US, and the original and best is at Three Dots and a Dash. It is not, however, easy to find. Wander down an alley off W Hubbard St (never mind the fact that the address says N Clark St) to find an unmarked entrance flanked by skulls. Once inside, go down the stairs to the basement where hidden treasures await… I only ordered one drink (the signature, presumably – its name was the same as the bar’s) and left considerably tipsy. You have been warned. This article was first published in November 2015, but was updated in September 2018 following another visit to Chicago.